Papilla penetrating - when the frenal fibers cross the alveolar process and extend up to palatine papilla. In such cases, it is necessary to perform a frenectomy for aesthetic, psychological, and functional reasons. There are numerous surgical techniques for the removal of labial frenum. In the "classical frenectomy" by Archer  and Kruger,  the frenum, interdental tissue, and palatine papilla are completely excised leading to exposure of underlying alveolar bone and thus leading to scarring. Though this technique resulted into an anesthetic scar, but this approach was advocated to assure removal of muscle fibers, supposedly connecting the orbicularis oris with the palatine papilla. It was thought that if this was not done, the diastema would reopen. Gingivoplasty of any excess labial and/or palatal tissue in the interdental area. One of the salient aspects of Edward's technique was the aesthetic maintenance of the interdental papilla. But the healed scar in the midline appeared anesthetic to the subjects. So in the following case-series, this technique has been attempted and results are presented. A 32-year-old male complained of receding gingival tissue in upper mid line region. On clinical examination, a papilla-penetrating upper mid frenum was found [Figure 1]a. 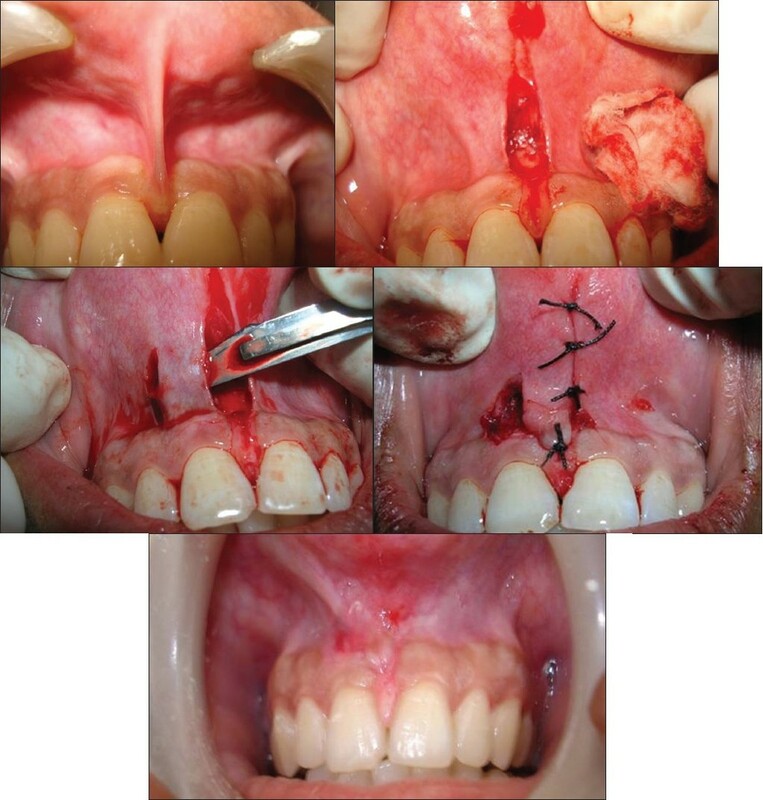 After local anesthesia, a horizontal incision was taken to separate the frenum from the base of interdental papilla. This incision was extended apically up to the vestibular depth to completely separate the frenum from alveolar mucosa. Any remnant of frenal tissue in the mid line and on the under surface of lip was excised [Figure 1]b. A vertical parallel incision was taken on the mesial side of lateral incisor, 2-3 mm apical to marginal gingiva, up to vestibular depth. The gingiva and alveolar mucosa in between these two incisions were undermined by partial dissection to raise the flap [Figure 1]c. A horizontal incision was then given 1-2 mm apical to gingival sulcus in the attached gingiva connecting the coronal ends of the two vertical incisions. Flap was raised, mobilized mesially, and sutured to obtain primary closure across the midline [Figure 1]d. No attempt was made to dissect trans-septal fibers between approximating central incisors. Gingivoplasty of any excess labial and/or palatal tissue in the interdental area was done, preserving the integrity of the interdental papilla. The surgical area was dressed with COE PAK TM (GC America Inc., Alsip, IL, 60803, U.S.A.). Dressing and the sutures were removed one week later. A healing zone of attached gingiva was clearly visible with no loss of interdental papilla [Figure 1]e.
In this case, high frenum was associated with the loss of interdental papilla and diastema [Figure 2]a. The same surgical steps were followed. Ten days post-operative observations showed the formation and maturation of attached gingiva in the midline [Figure 2]b. The patient had a complaint of a small nodular mass under upper lip. He had developed a habit of playing with it. On examination, a high frenum with a nodule was found [Figure 3]a. Same surgical steps were followed. Ten days post-operative view [Figure 3]b shows elimination of the nodule and healing with epithelialization in midline apical to the interdental papilla. A 20-year-old male patient was referred from the Department of Orthodontics for frenectomy. On examination, a papillary frenum associated with midline diastema was found [Figure 4]a. It was thereafter managed surgically following the above mentioned technique. Two weeks post-operative view [Figure 4]b shows a healing zone of attached gingiva in midline. One month post-operatively, the healing was complete and no scar was observed [Figure 4]c. Three months follow-up showed the results were static. The tissues were more matured and remodeled. There was no loss of interdental gingiva. The zone of attached gingiva was increased and the color was comparable to the adjacent tissue [Figure 4]d.
The outcome of this surgical procedure shows this technique produced a pleasing aesthetic result. Scar formation in the midline could be avoided. On healing, a wider zone of attached gingiva was obtained. It was color matched with adjacent tissue. Healing was obtained by primary intention. No loss of interdental papilla was observed. No complication was noted during healing period. Patient's compliance was also very good. In the era of periodontal plastic surgery, more conservative and precise techniques are being adopted to create more functional and aesthetic results. The management of aberrant frenum has travelled a long journey from Archer's  and Kruger's  "classical techniques" of total frenectomy to Edward's  more conservative approach. 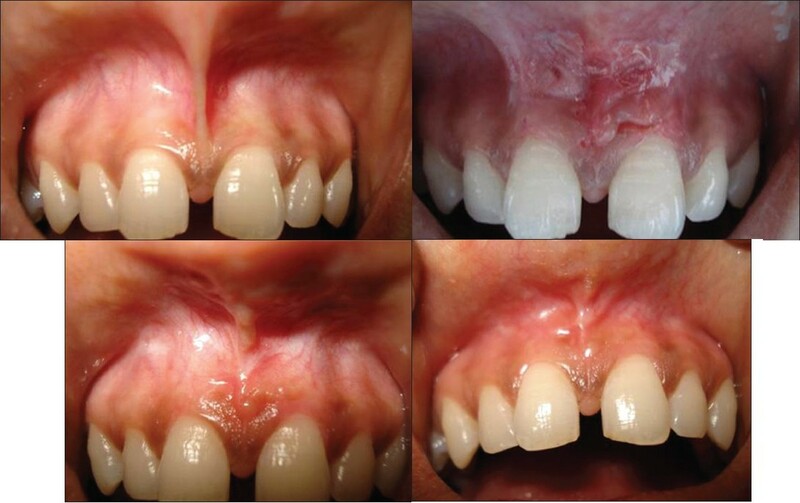 Recent techniques added frenal relocation by Z-plasty,  frenectomy with soft-tissue graft , and Laser , applications to avoid typical diamond-shaped scar and facilitate healing. Each method has its own advantages and disadvantages. A frenum is evaluated in relation to vestibular depth, zone of attached gingiva, interdental papilla, and diastema. If there is an adequate zone of attached gingiva, coronal to the frenum, it is of no clinical significance. A zone of attached gingiva is considered to prevent recession and it also gives an aesthetically pleasant appearance. 1. Phase-I: Inflammatory phase (day 1 through 5) - marked by classic features of inflammation, exudation of serum and migration of neutrophils followed by monocytes for removal of surgical debris. In the latter part of this phase, the epithelial cells from the margin begin migrating over the incision. Simultaneously, fibroblasts begin reconstruction of connective tissue. 2. Phase-II: Proliferative phase (day 5 through 14) - there is continuation of epithelial cell migration towards closer of wound. Fibroblasts lay down collagen and ground substance. The lymphatics re-canalize, blood vessels proliferate, and numerous capillaries develop. Granulation tissue forms, but it does not gain appreciable tensile strength. Clinically the area appears red, puffy and edematous, as is evident in [Figure 1]a and [Figure 2]a. In the later part of this stage, many of the inflammatory and proliferative changes start disappearing. Wound contraction begins and tissue gains appreciable tensile strength as is evident in [Figure 4]b. 3. Phase-III: Maturation/remodeling phase (day 14 through complete healing). Usually, by this time, epithelial continuity is maintained. Cross linking of collagen fibers takes place which results in gain in tensile strength. Inflammation and edema diminish. It is evident clinically in one month post operative photograph [Figure 4]c. Further maturation and remodeling, depending upon severity of wound, may continue. Wound contraction occurs over a period of few weeks and months. The tissue gradually becomes normal, healing is complete and no scar is observed. The three month post operative photograph, [Figure 4]d represents this stage. The healing process is regulated delicately by different cytokines like interleukins, platelet derived growth factor, transforming growth factor, fibroblast growth factor, epithelial derived growth factor, insulin like growth factor and others. This technique offers two distinct advantages. First, on healing, there is a continuous band of gingiva across the midline rather than anesthetic scar. The second advantage is that trans-septal fibers are not disrupted surgically to avoid any trauma to interdental papilla. This prevents loss of interdental papilla. In a study on 27 subjects with abnormal frenum who had undergone orthodontic closer of diastema, Miller did frenectomy combined with a laterally positioned pedicle graft. There was no loss of interdental papilla. No relapse of diastema was found in 24 cases and in three cases only minimal relapse (less than 1 mm) was noted. He has suggested that the newly formed broad attached gingiva contains collagenous fibers which may have a bracing effect and prevented reopening of diastema. He has further suggested that the ideal time for performing this surgery should be after orthodontic movement is complete and about six weeks before appliances are removed. This not only allows for healing and tissue maturation, but also permits the surgeon to use orthodontic appliances as a means of retaining periodontal dressing. This observations can be utilized during post-orthodontic retention period, but gain of attached gingiva in place of scar and no loss of interdental papilla are definite advantage of this technique. The attached gingiva in midline may have a bracing effect which helps in prevention of orthodontic relapse. 1. Henry SW, Levin MP, Tsaknis PJ. Histological features of superior labial frenum. J Periodontol 1976;47:25-8. 2. Taylor JE. Clinical observation relating to the normal and abnormal frenum labii superioris. Am J Orthod Oral Surg 1939;25:646. 3. Placek M, Miroslavs, Mrklas L. Significance of the labial frenal attachment in periodontal disease in man. Part 1; Classification and epidemiology of the labial frenum attachment. J Periodontol 1974;45:891-4. 4. Dewel BF. The labial frenum, midline diastema and palatine papilla: A clinical analysis. Dent Clin North Am 1966;175-84. 5. Díaz-Pizán ME, Lagravère MO, Villena R. Midline diastema and frenum morphology in the primary dentition. J Dent Child (Chic) 2006;26:11-4. 6. Gottsegen R. Frenum position and vestibule depth in relation to gingival health. Oral Surg 1954;7:1069-72. 7. Miller PD Jr. The frenectomy combined with a laterally positioned pedicle graft; functional and aesthetic consideration. J Periodontol 1985;56:102-6. 8. Archer WH (editor). Oral surgery - a step by step atlas of operative techniques, 3 rd ed. Philedelphia: W B Saunders Co; 1961. p. 192. 9. Kruger GO (editor). Oral surgery, 2 nd ed. St. Louis: The C.V. Mosby Co; 1964. p. 146. 10. Edwards JG. The diastema, the frenum, the frenectomy: A clinical study. Am J Ortho 1977;71:489-508. 11. Colten SM. Mucogingival surgical procedures employed in re-establishing the integrity of the gingival unit (III): The frenectomy and the free mucosal graft. Quintessence Int 1977;8:53-61. 12. Lawrence GB, Fowler EB, Moore EA, Murray DJ. The free gingival graft combined with the frenectomy: A clinical review. Gen Dent 1999;47:514-8. 13. Coluzzi DJ. Fundamentals of dental laser, science and instruments. Dent Clin North Am 2004;48:751-70. 14. Gontizo F, Navarro RS, Haypek P, Ciamponi AL, Haddad AS. The application of diode and Er;YAG lasers in labial frenectomy in infant patients. J Dent Child 2005;72:10-5. 15. Tait CH. Median frenum of upper lip and its influence on spacing of upper central incisor teeth. N Z Dent J 1929;25:116. 16. Kumar V, Cotran RS, Robbins SL. Basic Pathology, 6 th ed, New Delhi: Harcourt India Private Limited Publication; 1999. p. 47-59. 17. Gottrup F, Jensen SS, Andreasen JO. Wound healing subsequent to injury. 4 th ed, Munksgaard, Denmark: Blackwell Publishing Limited; 2007. p. 1-61. 18. Ten Cate AR, Deporter DA, Freeman E. The role of fibroblasts in the remodelling of periodontal ligament during physiologic tooth movement. Am J Orthod 1976;69:155.